In the background, I stamped Hero Arts Envelope pattern stamp using some Chai Distress Ink. Its just a very light detail but it looks kinda cool IRL! Next, I inked up that pitcher and then used the kissing technique with the Mehndi Medallion stamp just to give the pitcher some detail. I added some flowers and the sentiment from that same set, Iconic Images from PTI. And just for a little more detail, I rounded opposite corners of the base. There you have it! Super simple one layer card! 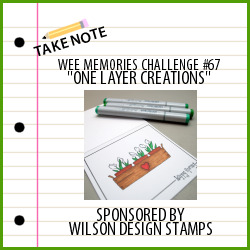 Check out Wee Memories for more challenge details! The sponsor this week is Wilson Designs! This turned out so cute! CAS definitely is your style and I love it! Lovely...thanks for the pretty inspiration! You have simplicity and beauty down to the perfect art form! I just love how white space on your cards just seems so clean and stylish. (it never quite looks like that for me :)! Now that's some super duper kissin' you got going off here, girlie! Love it! So pretty! Just a sweet design! wow Laurie! 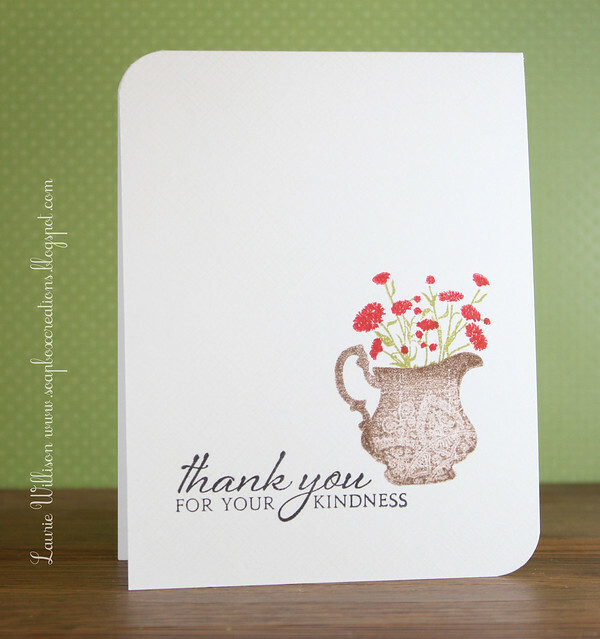 love the kissed pattern and pretty sentiment! Love the kissin' technique here Laurie! Perfect card for the challenge! Have fun at the fair! If we didn't have games this whole weekend, I'd find time to make it there! Beautifully done. Love the pattern on the teapot. Beautifl CAS--as always! I looked up PTI Iconic Images, but can't find it. Help?!?!? beautiful and reminds me that I want that stamp set. Love this CAS card. I know you love that Mehndi Medallion set so much--looks great 'kissing' the pitcher. The sentiment looks terrific tucked into the pitcher like that. You always WOW me with how you can make something so CAS look so elegant. Gorgeous. I have to CASE this! This. Is. Gorgeous. I haven't used my Iconic Images set yet....now I simply must. I love this, Laurie. This card is perfection! I love everything about it. I would make one layer cards all day if I could. Love the medallion kissed on the pitcher. Oh my stars!!!! Laurie - you have used this technique to stunning effect! WOW! This is brilliant! Very nice one layer card!! I always struggle with those!! I like how you stamped your vase with the kissing! Love this CAS card Laurie, perfection! Oh my your cards are simply gorgeous! I think I am going to case this one for some thank yous I need to get in the mail this week...thanks!